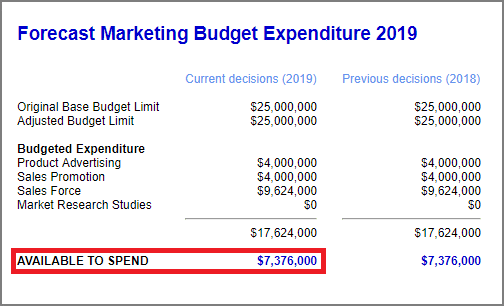 Should I spend all of my Marketing Budget? Each simulation year, your company will receive a fixed Marketing Budget with which to plan and implement your Sales and Marketing campaign for the year ahead. Your company’s budget will not carry over to the next year, so it is important that you spend the entire Marketing Budget that you have been given for this year to maximize your company’s performance. Your marketing budget is either 50% of last year’s gross margin or $25,000,000, whichever is higher (up to a maximum of $50,000,000). Your company’s Budgeted Expenditure report can be found under the Key Reports menu. You should always check this report after making your decisions to ensure you are within budget.